It has been quite a while since I have updated about my fitness. 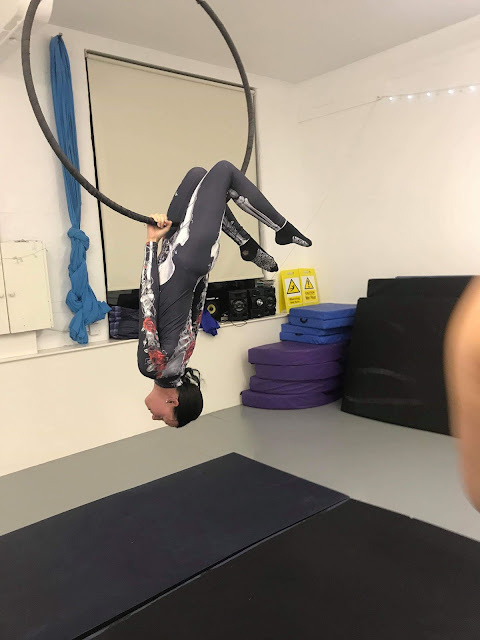 As some of you may know, I currently do Aerial Hoop, Pole and Silks as well as attend the gym and for a little while I was on a diet. I have now cut the diet, I feel I have lost enough weight to not have to worry about it, and the exercise I do helps it stay off. I do still try and intake protein when I can though, especially after a work out. One of the things that has come on in leaps and bounds is my strength and my confidence. I am finding tricks I at one point found impossible, now are a lot easier to do. On the pole I am easily going upside down now and I am so much more confident to let go with my hands and just use one leg. 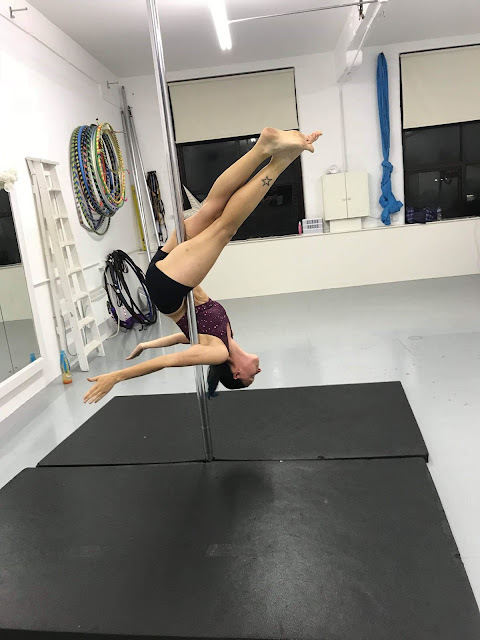 There are some tricks I have been trying to master for months now and have finally managed to do them and some I can do easily more than once. I feel great about myself for being able to do things that at one point I couldn't do. The same goes for hoop. I am getting so much stronger now and there are loads of tricks that I never had the strength to do before. 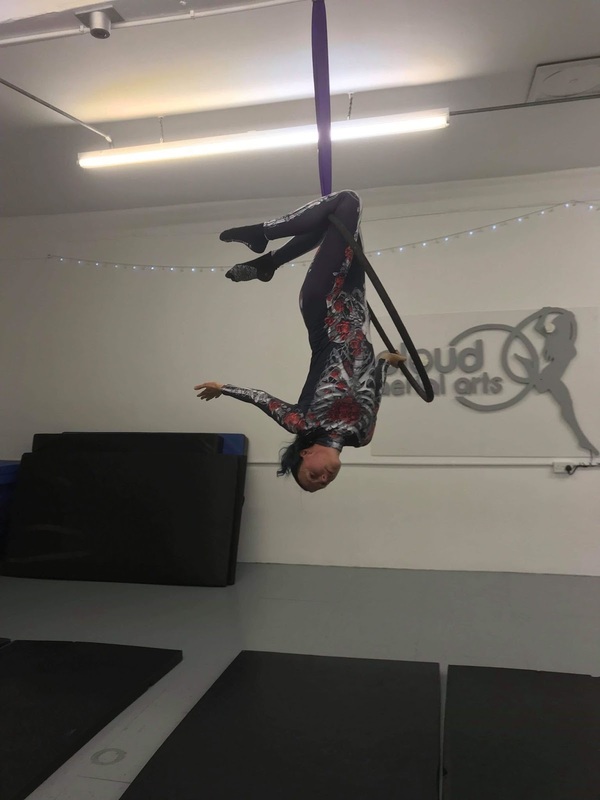 I am also becoming more daring and doing tricks from the top of the hoop. But not without bruising. I am still bruising and aching and also pulling muscles from my crazy tricks. 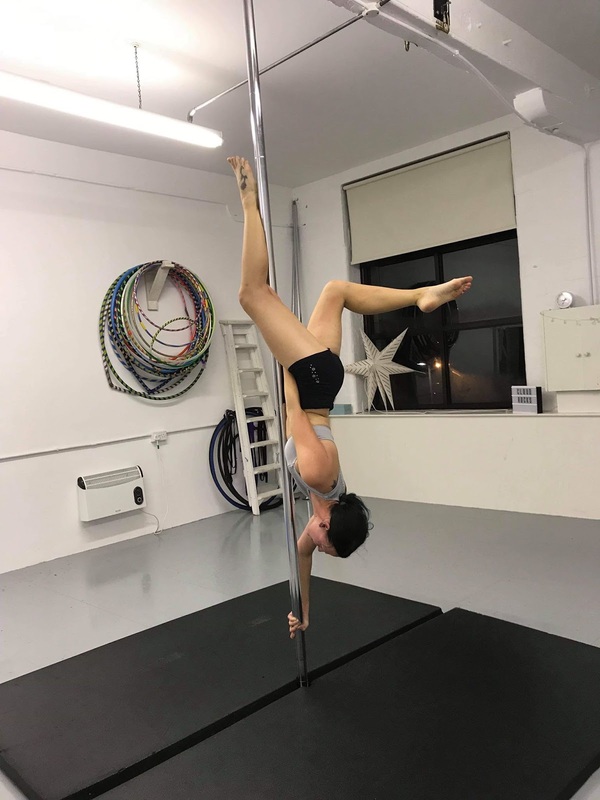 Here are a few photographs of some of my latest moves. What do you do in your spare time to keep yourself fit? I don't do anywhere near enough exercise - I wish I could get motivated! Wow! Great moves. I walk most days but am thinking bout joining the gym again as I enjoyed it previously. Wow! Well done you, what motivation! You certainly look confident and full of strength! Wish I could do that! I'm currently trying g to get in shape by doing Jillian Michaels dvds... ouch! Spare time :- Often wonder what that is. Life can be so busy. Fitness not really my top priority nowadays, I do have arthritis, etc. So limited in what I can do now due to health issues. I still like to go for a walk, slower pace now. So on the journey we enjoy the view, appreciate the presence of birds, trees, flowers, people for a chat, etc. We often have fun in the park :- Watching the dogs, running around playing, being sociable and friendly. Dog owners nearby keeping a watchful eye on proceedings. You seem to have determination. I know I would break an arm, leg or my neck doing that! Well done you! Wow! That's incredible! I definitely couldn't do that :) I'm really quite lazy and don't exercise much, but that looks like great fun! Looking forward to Photography post. Hobbies can keep us active, and life interesting. Wow! Well done you! I just play badminton to keep fit.